Images: Link (pdf is in the public domain; image taken from within). Next: [SCP-2753]: Let's Play Jenga! Special Containment Procedures: All copies of SCP-3079 are to be kept in a secure locker on-site. Access to these copies is limited to personnel with Level-4 clearance or higher. A Foundation-operated bot (I/O-NEWT) is to monitor internet traffic for any indication that an SCP-3079-A instance has been discovered (particularly among online communities centered around stage magic). Should non-Foundation personnel become aware of an SCP-3079-A instance, they are to be captured and amnesticized immediately. Description: SCP-3079, 300 Tricks: Stage Magic Made Easy, is a 435-page hard-back book written and self-published by Tobin Hollis.1 It contains detailed instructions for performing numerous stage tricks. 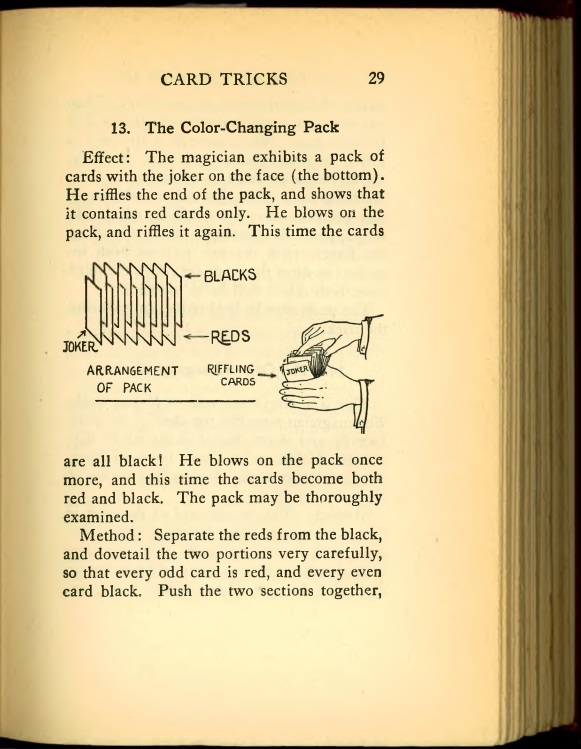 The majority of these tricks involve traditional techniques such as sleight-of-hand, misdirection, and optical illusions. Instances of SCP-3079-A are instructions contained within SCP-3079 which describe methods to achieve anomalous results. These instructions are scattered throughout SCP-3079; the text itself makes no distinction between anomalous and non-anomalous entries. There are 47 such instances in total. The anomalous nature of these entries were noticed immediately prior to its publication. All copies of SCP-3079 were taken into Foundation possession; all knowledge of its existence was successfully suppressed. SCP-3079's author was taken into Foundation custody, where he remained until his death several weeks later. Effect: The magician writes his name on a sheet of paper. He then asks the viewer to write her name on the opposite side of this paper. He proceeds to fold the paper several times over, before finally unfolding it to reveal that her name is now on both sides of the paper! NOTE: A diagram is provided demonstrating the complex series of folds required in order to cause this effect. While objects folded in this way undergo an anomalous process, they are not anomalous in of themselves. Effect: The magician produces a length of rope and a pair of cutting shears. He invites the viewer to step forward and examine both objects closely. Once she is satisfied as to their ordinary nature, the magician asks her to use the shears to cleanly cut the rope in two. Then, the magician binds both lengths together in a knot. He asks her to examine the knot, then asks her to cut the center of the knot with the shears. Upon making this final cut, the knot instantly unravels, revealing that the two lengths are now restored to one! NOTE: The method involves an anomalous type of knot able to fuse cleaved lengths of rope back together. Effect: The magician produces a deck of cards. The viewer is invited to examine it at her leisure, then shuffle it for as long as she pleases. The magician hands her his hat and tells her to drop any card she wishes into it. He then instructs her to put the hat on her head. Once finished, the magician takes the cards, shuffles them, and cuts the deck. He asks the viewer to take a card from the top of the deck and examine it. It is the very same card she took! Furthermore, when she lifts the hat from her head, the card is gone! In its place is someone she thought she lost long ago. NOTE: The method involves a particular ordering of the deck prior to the trick, a complex shuffling technique, and a hat of sufficient size. The object that appears underneath the hat is a domesticated juvenile white male rabbit. Every instance has proven to be both genetically and physiologically identical. Effect: The magician produces a folded silk handkerchief, which he proceeds to drape and unfold across his clenched hand. When he pulls the handkerchief back, his hand is full of beautiful hyacinths! One for each birthday he has missed. NOTE: A diagram describes the necessary folds that must be performed on the handkerchief to achieve this result. Notably, the number of hyacinths produced by this effect has increased by one each year since its discovery. Effect: The viewer is invited to think of a number between 1 and 9. The magician tells her to double this number, then add 9. Whatever number she has should now be between 11 and 27. Next, the magician tells her to take this new number and add its two digits together. If it is 13, the number is 4; if it is 15, the number is 6, and so on. The magician then reveals that he knows what number she now has: 11! She's probably grown up so much since then. NOTE: The method involves a precise set of phrases that the participant must both hear and understand. Testing has shown that when performed correctly, the participant will always end up with 11, despite the fact that this result is mathematically impossible. Effect: The magician burns what little money he has left to publish a book before it's too late. In it, he tells her all of his tricks. He tells her how sorry he is that he left. He begs her to forgive him. He begs her to let him see her one last time. And then — like magic — she reappears. 1. A highly successful stage-magician active throughout North America during the 40s and 50s.